A Fair For Dublin Cats? 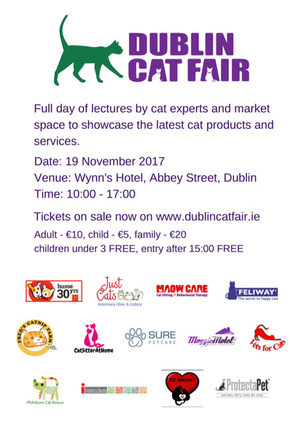 Dublin’s first ever cat fair will be taking place at Wynn’s Hotel, Lower Abbey Street, Dublin 1 on November 19 from 10am. You will be able to see the latest advancements in cat security, feeding, care and entertainment; and attend lectures from industry experts like cat vet Aoife Caulfield (Just Cats Vet Clinic), cat behaviourist Alice Chau-Ginguene (Maow Care) and Irish catnip farmer Aideen Day (Fred’s Catnip Farm). You can also hang out and chat with fellow cat lovers at our cat chat cafe. Tickets costs 10 Euro for adult, 5 Euro for child, 20 for family and grant entry for the full day. FREE entry for children under 3. 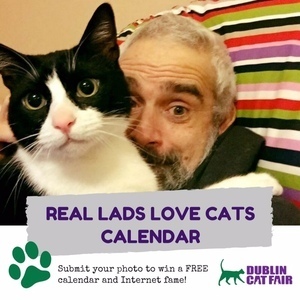 …before the event why not submit an entry to this year’s “Real Lads Love Cats” calendar, with the final product available on the day. Posted in Misc and tagged Dublin Cat Fair at 10:49 am on November 8, 2017 by Bodger. am I the only one getting “there was a problem trying to post the comment, please try again in a second” on iOS app? Martco, sorry. Stuart, our tech guy, is currently migrating the site on to a new server. Once that is done all will be well. Finally. Will the YouTube clips commenters post have a still image, like they used to, or just show links in blue text, thanks Bodger? Sure that’s nothing – legend has it there was a dog lifestyle magazine once.